National Football League Commissioner Roger Goodell took a public relations black eye over his lenient punishment of Baltimore Ravens player Ray Rice. That’s a lot less than the physical assault endured by Janay Palmer, Rice’s fiancée, who was apparently knocked out during an altercation with Rice on an Atlantic City casino elevator. Video shot by a bystander shows Rice dragging a seemingly unconscious Palmer off the elevator and into a hotel hallway. A New Jersey grand jury indicted Rice and charged him with third-degree aggravated assault, but the running back skillfully avoided prosecution by marrying Palmer and entering into a pretrial program in May. Nevertheless, Commissioner Goodell found Rice guilty of violating the NFL’s personal conduct policy and slapped him with a two-game suspension. Rice will forfeit $470,000 in salary, but is permitted to participate in the Ravens’ training camp and preseason games. Putting this in perspective, Rice’s two-game suspension is precisely what Cleveland Browns’ wide receiver Josh Gordon received for testing positive for marijuana. And it’s less than what he would have received had he tested positive for steroids. So there you have it. According to the NFL’s value system, a woman’s life and dignity is worth the same as a marijuana cigarette but less than a needleful of human growth hormones. As the executive director of A Woman’s Place (AWP), I am heartened by the vociferous public backlash against Commissioner Goodell’s verdict, especially from men — for if we are to eliminate domestic violence from our society, men must play a leadership role. Which brings us to Commissioner Goodell. Several media outlets reporting on the public backlash against the Rice decision have posed rhetorical questions such as “Does the NFL Have a Women Problem?’’ and “Does the NFL Have a Domestic Violence Problem?’’ Yes and yes. But more significantly, the NFL has a leadership problem. The Ray Rice case would be appalling enough if it were an isolated instance, involving one player on one team. But it is not. According to the U-T San Diego newspaper, which maintains a database of NFL arrests (www.utsandiego.com/nfl/arrests-database), 21 of 32 NFL teams employed a player with a domestic or sexual violence charge on their record last year. What makes this statistic so shocking is that this was the state of the NFL a year after Kansas City Chiefs linebacker Jovan Belcher shot dead his 22-year-old girlfriend before driving to the Chiefs’ training facility and fatally shooting himself in the head on December 1, 2012. So, yes, the NFL has a women problem. And a domestic violence problem. And a gay problem. And maybe even a race problem. Less than a year ago, the league was scandalized when Miami Dolphins player Jonathan Martin quit his team over alleged racial bullying by several teammates. A league investigation found that the players bullied not only Martin, but a Japanese-born assistant trainer who was, according to the NFL report, “repeatedly targeted with racial slurs and other racially derogatory language.’’ At least two of the bullies are still employed by the NFL. More recently, former Indianapolis Colts Coach Tony Dungy made comments about Michael Sam, the first openly gay player to be drafted into the NFL, that were perceived as derogatory. While Coach Dungy has attempted to take back his controversial remarks, there is no indication that his comments will affect his role as a commentator on NBC’s Sunday Night Football telecasts, the league’s premier primetime showcase. NFL training camps have opened for a new season, but the league’s internal culture remains unchanged. The tone-deaf comments by Commissioner Goodell and the Ravens’ front-office personnel regarding Rice’s punishment only reinforce that impression. “I believe you are sincere in your desire to learn from this matter and move forward toward a healthy relationship and a successful career,’’ Commissioner Goodell said in a letter to Rice that was released by the NFL. Ravens’ Coach John Harbaugh said, “I stand behind Ray. He’s a heck of a guy. He’s done everything right since.’’ Ozzie Newsome, the Ravens’ general manager and a former NFL player, praised the league office for its “thorough process’’ in reviewing the Rice “incident’’ and for taking “extra steps’’ when deciding “discipline issues.’’ “While not having Ray for the first two games is significant loss to our team, we respect the league’s decision and believe it is fair,’’ Newsome added. Last year, 158 Pennsylvanians died in domestic violence incidents. The victims ranged in age from 2 to 91. Sixty-three were shot, 24 were stabbed, 6 were beaten, 4 were strangled, 2 were burned, and 1 was shot with an arrow, according to PCADV’s annual fatality report, which is available to the public at www.pcadv.org. Professional football is America’s favorite sport. Its players are viewed as role models and most of them live up to that role. Sadly, some do not. 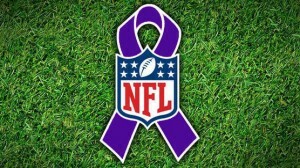 The only way the NFL can avoid further damage to its image is if its leaders – Commissioner Goodell, the owners, general managers and head coaches – lead by example and say NO MORE to domestic and sexual violence. And back it up with comprehensive programming to address the sexism, racism, and heterosexism that is the oppressive and life damaging culture of the NFL. We owe it to our boys as well as to our women and girls. None of us are equal until all of us are. Thank you for this informative assessment of the treatment of domestic violence in the NFL. It’s definitely time for us to start addressing the reality of this network of people who make exceptions for things that would be considered unacceptable in the real world. The situation with the child abuse at Penn State caused an uproar. Why shouldn’t this be seen in the same light? Abusing someone is just wrong, any way you look at it.